My mum works at my dad’s restaurant only during the day. She worked both day and night when the restaurant first opened but now that things have settled and enough staff have been hired, she’s home after lunch service to do household chores etc. and more importantly cook dinner for my younger brother and sister. While my dad is a chef, my mum does most of the cooking at home. The food we have at home is different from the food served at the restaurant, flavours are often simpler but just as tasty, and it’s more wholesome with large quantities for sharing and leftovers. However, my mum often gets sick of cooking and gets quite lazy about it. It can feel like more of a chore to her. I guess this is what happens when you work at a restaurant all day, when you come home the last thing you want to be doing is cooking, especially when you have been doing it all your life out of necessity (ie: to feed a family) rather than as a passion. Unlike me, where I get to experiment with my cooking and try new dishes all the time, and find it a gratifying endeavour. When my mum cooks for the family, it is an act of compromise where she tries to reconcile the different food preferences within the family, make sure we have a healthy and balanced diet, as well as cooking within limited timeframes and trying to be economical. So my mum has quite a few go to recipes that she rotates around, which she knows us kids like to eat and are easy to cook. Her go to recipes are ones that make a lot of food, can be prepared ahead of time, requires little effort and tastes great. It’s food that has leftovers you wouldn’t be sick of eating the next day and would be happy to eat more often. Everyone has go to recipes, what are yours? This is one of my mum’s go to recipe. It's a delicious, comforting and homey dish. This dish is very easy to make, all you have to do is chunk everything into a pot, marinate it overnight and then steam it the next day so it’s great for weeknights after work. 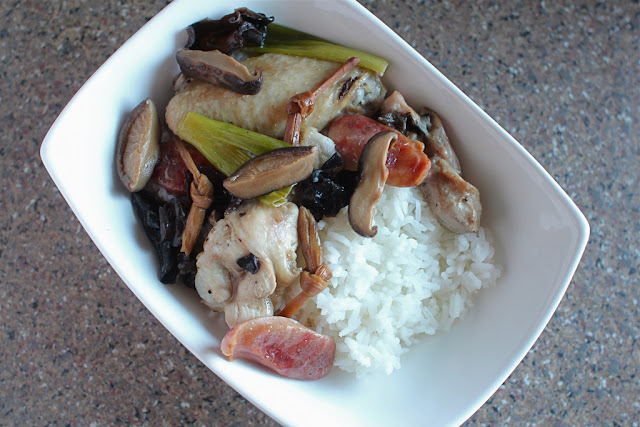 I love this dish because there is a lot packed into it and it contains some of my favourite foods – chicken, shiitake mushrooms and Chinese sausage (lap cheong). I like being able to pick out different goodies to eat. 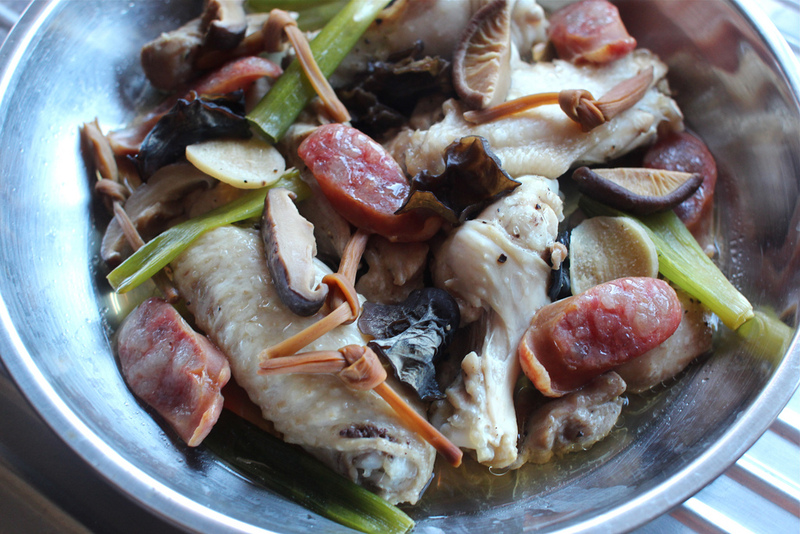 It’s a dish that reminds me of living at home because it would frequently feature on the dinner table, and I remember fighting over with my younger brother and sister for the last bit lap cheong, because no matter how much lap cheong my mum would put in, there would never be enough. This is also quite a delicately flavoured dish in that you’ll find the seasonings are not overpowering but are there to lift the natural flavours of the other ingredients. Combine everything together with the seasonings in a pot/large bowl and marinate overnight. Steam over medium-high heat for about 20-25 minutes until the chicken is cooked through. • See my steamed fish post for more details on how I steam dishes. 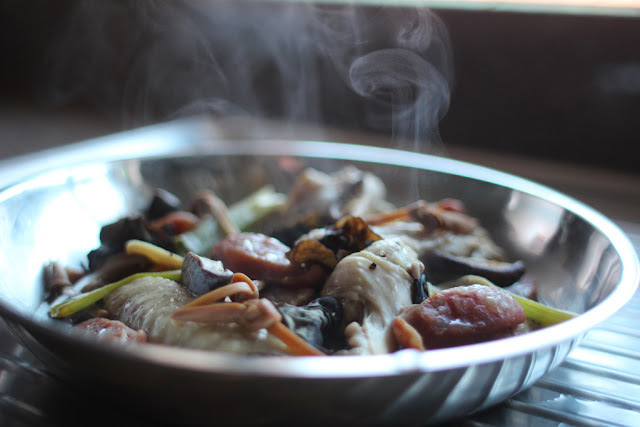 • It’s a large quantity so you may have to divide the steaming into two batches or you can steam half one night, refrigerate the rest to steam the night after. • Dish can be reheated in the microwave or resteamed for about 10 minutes. • You can marinate the ingredients and then freeze it in containers. Take out to defrost and steam when you want a meal. Are the dried lily flowers easy to source? So I tried this today, made it with chorizo instead of Chinese sausage.... was good, particularly the sauce that comes out of the chicken after steaming. I have never cooked it using chorizo before, I guess it would add some spicy flavours to it. 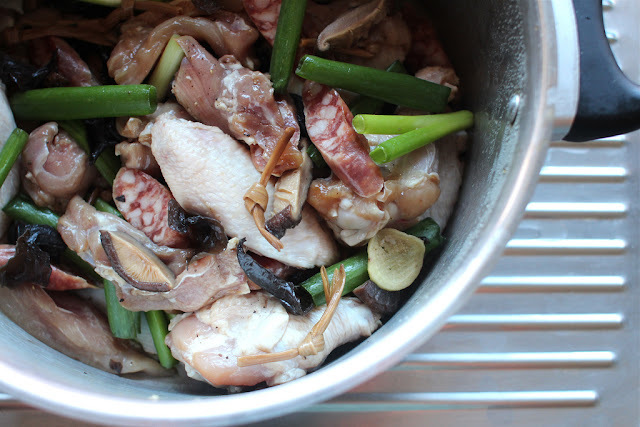 The natural juices coming from the chicken and other ingredients is great, I love spooning it over my rice to eat! I love all the flavours in this - I'm going to make it one night soon. Thanks for the delicious inspiration, Ai-Ling! Thanks Christina :) Hope you enjoy the dish! My dad used to make this dish when he was still alive. Glad I found this it was yummy though I kinda tweaked it a bit. I used olive oil and browned the garlic and add the chicken thighs to it. Cooked it until it was almost done and added it to the rice while it was close to a boil. 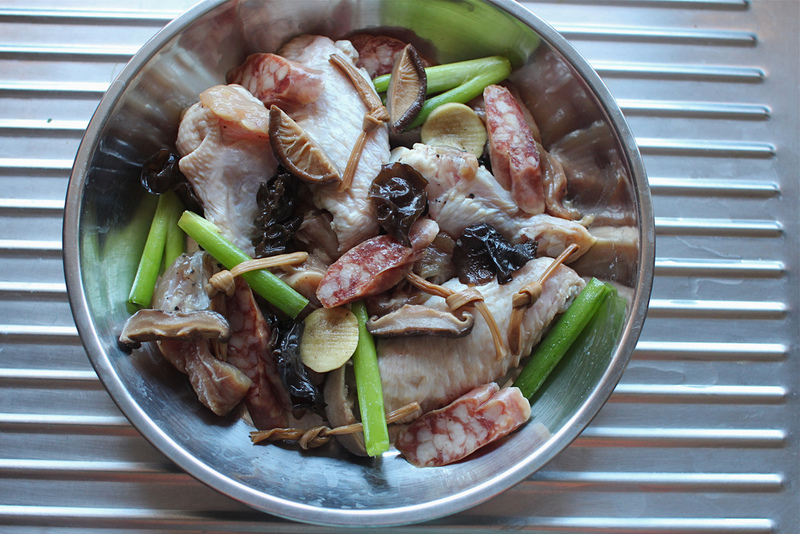 I added the chicken 1st then layered the sausage, shiitake mushrooms(i didn't have the wood ears :( ) and dried lily flowers on top to let it steam. The sauce I didn't add cornstarch and fish sauce. I used sugar, 5 spice powder, and chili flakes. 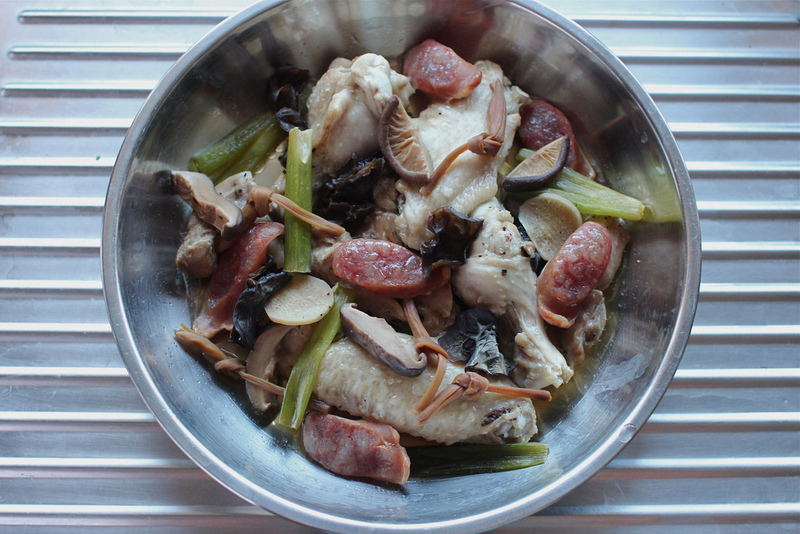 Thanks for sharing your adjustments :) Good to know that a basic recipe like this can incorporate different elements! I am curious about the lily flowers - do you take them out after cooking or do you eat them? You leave the lily flowers in and you can eat them.